We organise a whole heap of scavenges across Australia. It doesn't have to be seaside... we hit lakeside, riverside, creekside locations too. beach clean and clothes swop at Rotary War Memorial Athletic Field, Lane Cove. Live music, workshops, community group talks. The first Lakeside Scavenge happening in the ACT. Picking up rubbish from Lake Burley Griffin on May 25th 2019 alongside live music, second-hand markets and much more. Beach clean, clothes swop at Frankston Foreshore. 15th June. Live music, prizes, workshops. Beach clean, clothes swop in Ulladulla. Eurobodalla Shire Council. South Coast. Beach clean, clothes swop at Main Beach, Byron Bay. Live music, preloved markets, talks, workshops. Beach clean and clothes swop Port Stephens. Pre-Loved markets, live music. Beach clean and clothes swop at Clifton Gardens. Northern Beaches Sydney. Live music, prizes and talks. We’re heading over Bronte way with our trash for treasure market as part of @Waverly Councils Summerama!! How does it work? For every 10 pieces of litter you collect you can earn yourself a Trash Token to spend on some pre-loved goodies, which is great news considering that a whopping 6000kg of textiles end up in landfill in Australia every 10 minutes. By buying second-hand not only are you getting some unique threads your helping keep our environment a little happier. If you have any quality pre-loved goods, feel like helping out for the day or are a local business willing to take the plastic-free pledge and help fight the tide of plastic pollution, then please hit us up. Head to the link to register and keep up to date with all the good stuff coming your way! Join us at Rye Pier for the fourth Seaside Scavenge beach clean and trade the trash you collect for coffees, food and stylish second hand clothes! This is a community run event supported by Coastcare Victoria and Mornington Peninsula Shire to raise awareness of plastic pollution, connect like-minded people and help motivate our community towards reducing our disposable plastic footprint on Port Phillip Bay. There will be increcible prizes from local businesses to be won, such as a double pass dolphin and seal swim, talks on plastic pollution from local NGOs, plus workshops on how to upcycling everyday waste into useful items. Plus the Bandwagon will be hosting a stage for local bands, helping to set the seaside feel and get us into the beach cleaning spirit. Join us to clean the beach and be part of Rye's inspiring summer festival! The fifth Scavenge will be taking place in November... You know the drill Port, cleanup and trade the trash for pre-loved treasures, check out a line-up of live musicians and maybe win a prize from an epic local businesses. For those of you salty crew that haven't heard of what we do, listen up. The Scavenge is about putting a value on litter! So come down, clean-up your community and trade the trash you collect (once sorted/catalogued) for the funkiest of pre-loved threads, books and more in our pop-up market. Thanks to the support of City of Busselton There'll be live tunes from local musos to lap up, conversations with local green groups to be had & all round change making action to get in on. With 63 billion gallons of oil used annually in the US to produce plastic bottles, there's more to the plastic pollution issue than just cleaning up. So get ready to do more than just recycle, it's time to give single-use plastic the boot, start purchasing quality made garments over cheap synthetic ones and all round become a conscious participant on this planet. We’re looking for volunteers, clothes & good donations & businesses to take the plastic-free pledge! On the 10th of November, we'll be launching the first Seaside Scavenge West Coast Chapter... So what? Basically, the opportunity to clean-up your beautiful coastline and trade the trash you collect for the funkiest of pre-loved threads donated by the local community and maybe even a sneaky beer if you're lucky! With 7.2 billion butts littered annually in Oz, we've got some work to do shaping the way Aussies think about litter and helping those incredible creatures of the sea. Buut we know trash doesn't get everyone going, that's why we'll have a line-up of local musos to keep the good vibes flowing alongside local green groups and plastic-free advocates. So, you know what to do - 1) put it in the diary 2) spread the word 3) get in touch if you want to help out 4) donate any quality second-hand stuff you no longer use! Head to the Facebook link for more info. With 5 trillion pieces of plastic floating in our oceans today & an estimated increase of 10 times that predicted by 2025, it's high time we picked up our act! Thanks to the support of City of Cockburn we’ll be hosting the first Omeo Park Seaside Scavenge where you can clean-up your community & earn the funkiest of threads for it! Sounds good huh?! You'll also be inspired to cut back on your single-use plastic consumption because if we're serious about reversing those prediction for 2025 (only 7 years away) we're going to need to do more than just clean-up the beach! So come get amongst the action in November… We’re looking for volunteers, clothes & good donations & businesses to take the plastic-free pledge! In the market for some sweet new threads? Hanging out to save some turtles? Or just needing a groove to some beachin’ beats? Sounds like your craving some scavenging action... and lucky for you we’re hitting the west coast for the first time. With 300 million tonnes of plastic produced annually, there’s a whole heap that makes its way out to sea and into the stomachs of innocent marine and bird creatures. So that's why every 10 pieces of litter you pick-up and sort at the Scavenge, will earn you a Trash Token valid in our pre-loved, pop-up market full of funky pre-loved clothes, books & more. There'll be a bundle of local green groups to chat with, local live musicians to lap up and the chance to fill your noggin with tips on how to avoid single-use plastics. We’re looking for volunteers, QUALITY clothes & good donations & businesses to take the plastic-free pledge! The last Lakeside Scavenge in Jindabyne was an impressive demonstration of community passion and love to keep the mountains clean, that we couldn't but help stay away. Thanks to funding from the Snowy Monaro Council we will be coordinating another Scavenge to coincide with World Clean-Up day and we hope you can make it. For more details head to this Facebook link. It's been two years since we scavenged on the Gold Coast, but thanks to the support of the local council we're back again as part of the Travelling Trash Troupe. This time, we'll be teaming up with Plastic Pollutions Solutions and Boomerang Bags to bring a spread of single-use plastic and fast-fashion awareness. To find out more, head to this Facebook link. There's no denying that single-use plastics & fast fashion are shaking things up for mother nature. Come down to the THIRD Coffs Coast Scavenge to TRADE beach litter for the funkiest of pre-loved CLOTHES, drinks and even win a prize or two for your epic efforts! Thanks to the support of the Coffs Harbour City Council we'll have a long line-up of local musicians to tap your toes too, a bundle of local green groups to get to know and just a general air of change making action that you'll want to be part of. We're looking for donations of QUALITY pre-loved stuff, businesses to take our plastic-free pledge and any movers and shakers to give us a hand... So get in touch or see ya there! Thanks to the support of Eurobodalla Shire Council we’ll be hosting the first Batemans Bay Seaside Scavenges where you can clean-up your community & earn the funkiest of threads for it! Sounds good huh?! Especially as the current prediction for 2050 is that there’ll be more pieces of plastic than fish in the sea, we better start cleaning up our act! Come get amongst the action… we’re looking for volunteers, clothes & good donations & businesses to take the plastic-free pledge! It's been a while since we've got together.. So next Tuesday in celebration of World Environment Day we're organising a catch-up in Sydney's CBD. The local Port Macquarie Chapter is bringing the Scavenge to Port for the 4th event and first independently run Scavenge for the area with support from Taronga Zoo! The Scavenge will be taking place at West Port Park alongside a bunch of live local musicians, passionate environmentalists and groovin trash trading action. The Scavenge is hitting the South Coast... Finally!! For those of you salty crew that haven't heard what we do, well listen up. Seaside Scavenge is a waterway cleanup & clothes swap event where the litter collected becomes the currency to purchase quality pre-loved clothes, books and more that have been donated by the local community. So, we're looking for QUALITY pre-loved goods (clothes, books, toys, games etc) -- if you've got the goods, get in touch! Otherwise, we're going to have a line-up of bumping musos, talks from local marine groups and some schnazzy upcycling workshops to learn all the plastic-free lifestyle skills. There's a whole lot in the pipe-line, we're just getting down to the organising, so stay tuned for the deets! And if you want to be involved we're looking for volunteers and helpers to organise so shoot us a message ! See you at White Sands Beach on the 24th at 10am! It's our local stomping ground... So it's an absolute pleasure that Randwick City Council is having us back for the 3rd year running! As usually the legends over at the Coogee Pavilion are on board to reward you hard working Scavengers with a well earnt beverage. We'll have a spread of funky pre-loved stuff for you to chose from as well as a list of local legends to hear from! Hopefully you know the drill but if not come along and you'll slide right in! We'll be hosting the first ever Balmoral Scavenge with the support of a spread of local green groups. There'll be a whole heap of trash trading action, live local musos and all round good vibes. If you've missed the memo at the Scavenge, litter you collect becomes the currency to purchase second-hand threads and goods that have been donated by the wider community. There's also prizes, sometimes beers and a whole heap more to lap up! We'll be bringing the Scavenge vibes south in November. We want our debut in Melbourne to go out with a bang so we're bringing it big time with a bountiful collaboration with The Bay Keepers, Beach Patrol, Sea Shepard Marine Debris Crew, Scab Duty and all the other conscientious folks we can round up! The day is going to be filled with sweet tunes, an enormous amount of scavenging action, loads of cafés going plastic-free for the day and a heap of funky goods to be scored. If you've got ideas, people, businesses or anything else to get us on our way then please get in touch. Or if you just want to find out more head to the Facebook page. For the third year running the crew down in Rye Pier, Mornington Peninsula will be hosting the Seaside Scavenge Festival. A full day of festivities from beach cleaning to Trashy art competitions. There will be a spread of local marine organisations attending who will get you up to speed with whats happening in our oceans, what we can do to help and most importantly how to have a blast while we clean it up! At the last event in January these guys removed over 600kg of trash from the stretch of beach at Rye. We're hoping that this year there won't be quite as much! But with Christmas and New Years just weeks before hand we suspect we'll need every set of hands around to get this stuff before it reaches the shoreline! If you're interested in getting involved, donating your pre-loved stuff or anything in between please get in touch via the event page. 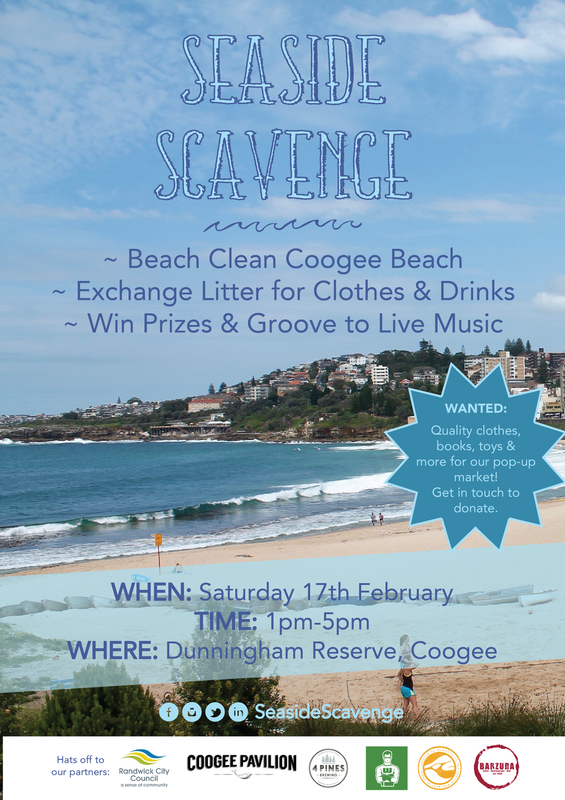 As part of Manly Ocean Care Day we'll be running a Scavenge pop-up market to clean-up Manly and the surround area. Come down and check out the incredible list of organisations working to combat marine debris pollution. It's truly an inspiring day to see the collective dedication of organisations across Sydney and Australia working together to clean-up our oceans. We'll have the usual spread of funky, thrifty goods for all ages. There will also be a line-up of marine debris talks, plastic-free living tips and tricks and lively local musos to keep the spirits high! We're hoping for a splendid day in the sun... come down and check it out. We'll keep you posted with more info through our Facebook Event. We're hosting a corporate fundraiser event for businesses to submit a team of 4-6 staff to take part in The Scavenger Hunt. This is an opportunity for employees to engage with tasks and activities that improve knowledge and action on waste separation, energy efficiency and plastic reduction in the workplace. The funds raised will go towards ensuring the longevity and success of Seaside Scavenge events by contributing to a new van or trailer to move our event and materials around Australia. As we are a travelling charity our mode of transport is crucial! We have found that interested businesses will either pay directly to submit a team as a donation for an educational and team building training day. Otherwise, teams can fundraise the amount. We can provide more information on how to fundraise. Please see the attached brochure for more information. After our debut Traveling Trash Troupe event in August, the Seaside Scavenge is back by popular demand. We'll be setting up as part of the Sustainability Living Festival in Coffs and spreading the re-use love. Be sure to come on down and get amongst the action! There's beers up for grabs from the Plantation Hotel, a tonne of pre-loved threads to grab and a whole heap more! This is our first ever Creekside Scavenge, so let's make it a good one! Event deets to come. Otherwise head to our the event page to find out more. We're very happy to be rolling our way back into Port for the second year running! With the support of Taronga Zoo and Port Macquarie Hastings Council we'll be setting up a Port Macquarie Seaside Scavenge Chapter so that there can be regular Scavenging action around town. We've got support from a whole heap of local businesses, awesome local green groups like Boomerang Bags and Coastal Warriors and tantalising musicians to get us tapping our toes. Head to Facebook event for more deets. It's about time we made our way down to Maroubra to clean-up the shoreline and the spectacular headlands! Thanks to Randwick City Council we'll be kicking the first weekend of summer off with the best kind of Scavenging action... The kind where you get to lap up local tunes, get rewarded for the litter you collected with the funkiest of pre-loved goods and if you really put your hear and soul into it, you might even land yourself a prize from wicked local businesses. We're in the beginning stages of planning this one, so stay tuned for more deets! We're pretty pumped to be taking the Scavenge southside to the Snowy Mountains just in time to wrap up the season! We'll be hosting a Lakeside Scavenge to clean-up along the foreshore and all around Jindy. With all the snow melting the level of the lake (well it's actually a dam) will be rising and we don't want it to take with it all the trash that gets left behind from all the tourists that head that way. So join us for the good times! Stoked to be joining in at Coffs Harbourside Market and turning it into a trash for cash space. Kim already has the Fashion Exchange happening down there, so we're looking forward to getting people using their litter currency this time round. Thanks to the Coffs Council as well as many local businesses, individuals and green groups for all the support! Stay tuned for more details or head to the event page on Facebook.